USD/CAD retained its bullish bias on the charts and managed to run up to the trendline resistance. USD/CAD is likely to trade between a range of 1.3100/1.4000 for the year. What was very interesting was the Loonie's behaviour around the Fed. 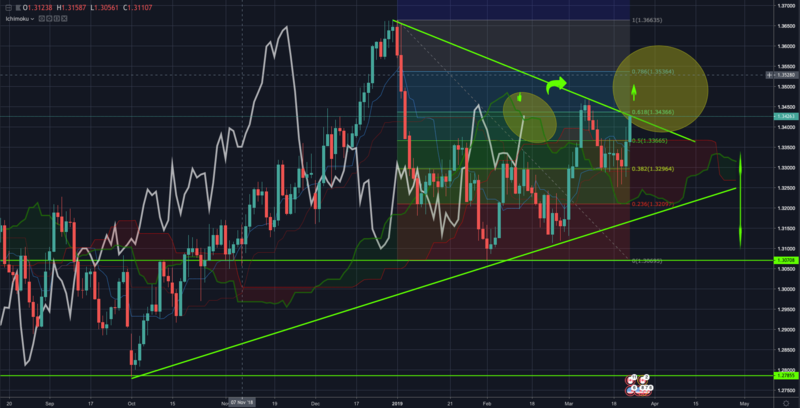 USD/CAD retained its bullish bias on the charts and managed to run up to the trendline resistance by the close of play for the week, and that was despite a more dovish turn out from the Fed; The dollar is still the cleanest of the dirty shirts as investors remain concerned over global growth. What was very interesting was the Loonie's behaviour around the Fed. Despite a pickup in risk appetite following the announcements, the CAD was the laggard in the G10 space as traders remain dubious over the domestic economy and the currency is still unable to befit from external forces. Against a fundamental backdrop, which includes, of course, the convictions at the Bank of Canada where the broader slowdown was a critical factor which forced the central bank to remove wording at its last meeting around the need for rates to rise to the neutral range over time, USD/CAD is likely to trade between a range of 1.3100/1.4000 for the year, although the balance of risks implies that the pair will spend the majority of its time this year in a narrower 1.31-1.38 range. Note: (Analysts at TD Securities explained that domestic demand contracted through H2-2018 and went onto argue, "this, together with the latest disappointment in retail sales data, introduces the risk that January GDP could lean negative. That could drag Q1 GDP into negative territory with it. Accordingly, we can't dismiss the prospect that the economy is already in recession"). For Canada, Industry-level GDP (Jan) is out on the 29th March where energy sector distortions are expected to overshadow more positive developments and keep industry-level GDP unchanged in January. However, consecutive declines into year-end will keep Q1 growth tracking below BoC projections (+0.8%). As for the US, there will be a number of Fed speakers, featuring no fewer than 14 public comments from 10 officials. While the Fed has communicated quite clearly that there will not be a rate hike this year, it will still be worth tuning into to the hawkish leaning voters such as Evans, Rosengren and George o see if they still argue for a tighter policy this year. From data, PCE (Jan) will be in focus where expectations for core inflation are for a 0.2% m/m pace and leaving the annual rate slightly below 2% for a fourth straight month. All in all, a less busy schedule next week but it will also be worth keeping a watchful eye on technical developments in global oil prices on the charts (dropping back towards a critical support area ($57.85/95 WTI from the 4-month highs scored earlier in the week). There is currently a tug of war between an appetite from producers hedging at current prices, capping the price of oil and mammoth draws in the US which have been supporting domestic crude prices and narrowing the WTI-Brent spread. Further to last week's analysis, where USD/CAD was presumed bullish while above the weekly Ichimoku Cloud, the Loonie was indeed faded around the 38.2% Fibo of the late Dec highs and late Jan lows. Bulls subsequently picked up the pair at a discount just below the 1.33 the figure for an attack through the 50% Fibo which drew in further demand on dips towards the 61.8% Fibo and trend line resistance and just shy of the early March 1.3450/60 swing high territory. Conversion Line is greater than the baseline. However, should the bears step in, which could come as a result of a corrective spike in the price of oil, the risk is back towards the 38.2% Fibo and a subsequent break there will bring in the 23.6% Fibo and trendline support where a break out opens risk back to 1.3070 support and 1.2780 below there. The FXStreet forex poll of experts is a sentiment tool that highlights near- and medium-term price expectations from leading market experts and it shows a bearish outlook on a forward basis.